May 23, 2011 by Venky. So, what are the weekend plans, dude? It is the season of marriages and vacations for kids. So, when one of my cousins decided to get married, it meant a trip to hometown for the family. Two weeks in advance. That means an entire weekend for myself and for my Bulldog to go riding. No deadlines for rides to end by so and so time. That is a luxury a few married souls hardly get. A chain of emails to a few friends with ride plans and a plan was etched to make the most of the weekend of 21st and 22nd May. Ooty climb was on my mind for quite some time now. Ever since I read stories of TFN going through the tough climb stage, the climb intrigued me. From this part of the world, Ooty has two primary approaches. One through Kalhatty ghats and the other from Gudalur. For both one would need to go through two huge reserve forests. Bandipur forest in Karnataka and Madhumalai Tiger reserve in Tamilnadu. The plan was to try and get to Masinagudi early on Saturday morning so that we can try the Kalhatty climb on day one and Gudalur climb on day two. Initially Kalkat also was supposed to join Vineeth and me for the trip. Then a friend’s marriage reception on Saturday night meant he had to drop off. So, Vineeth and I decided to go ahead and give it a shot. The Kalhatty climb gains 1200mts of elevation in about 12kms giving an average elevation gain of around 10% with a few stretches going up to 15% or more of gradient. The 36 numbered hairpin bends are stuff of nightmares for someone like me and quite a challenge even for the strongest of riders. The climb up to Ooty from Gudalur however is a less steeper climb but a longer one. It gains the same elevation in about 20kms. It becomes a rolling terrain after the initial big climb. Since the legs will be fresher on day one, we decided to try the tougher of the climbs first. I had my doubts if I will be able to get the Bulldog up those steep gradients and those 36 hairpin bends. Friday night sleep was sparse and filled with nightmares of me coming down those hairpin bends on a full bus that was out of control. Why bus? I didn’t even bother to decipher. It just told me how much I dread the climb. Our stay was at a small resort at Masinagudi. Vineeth and I parked the car in the resort and headed for the climb around 9am on Saturday after a bit of breakfast. The plan was to ride not all the way to Ooty but complete the climb and turn towards Gudalur and come back to Masinagudi to complete a loop. Nearly a century and a lot of climbing. 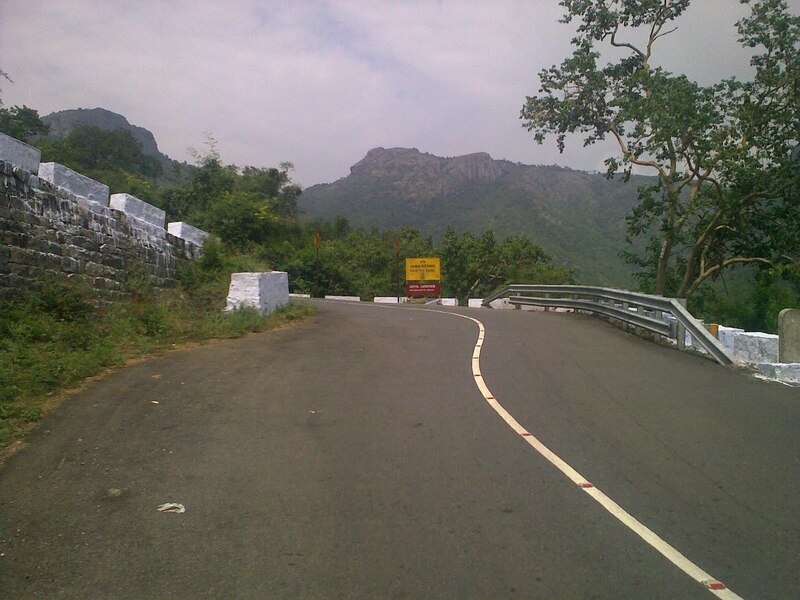 The distance to the top of the climb from Masinagudi is around 23kms with 12kms making the killer climb. The approach route before the actual climb starts is also quite rolling with grades around 5% for small stretches. That was a good warm-up for the climb. Or so I thought! 36/36 Hairpin Bends From Hell..
As I approached the climb slowly, even before the hairpins started the gradient felt tough. I kept going trying to push and trying to stay on the saddle. It was getting impossible. I found myself standing up and trying mash within no time. It meant that the heart rate shot up even before I made a few precious meters of progress. I had no choice but to stop to regain composure. I stopped a couple of times even before the hairpin bends started. When I finally got to the hairpins, the sign 36/36 on the yellow board raised my heart rate by a few notches even when I was just standing there and staring at it. I told myself not to think too much and try to move forward. I started and surged ahead from the 36th and crossed the 35th hairpins but had to stop again. It was hardly 200 meters but felt like a lot of effort. I tried to tell myself to try and go forward even if it meant stopping at every hairpin bend. But every time I stopped the steep gradient meant that I had to do switchbacks on the road to get started again. Switchbacks within switchbacks(moving like a snake). That would have been fine if I had the road all to myself. “Ha ha.. fat chance. Dude, we cannot give up on one of the last weekends of the summer vacation that we can spend at one the greatest summer destinations so that you can ride your fixie up the hill. Go buy your own hill.” The continuous traffic seemed to mock at me. So many four wheelers were struggling up the hill roaring, moaning, pleading their way up the hairpins one after the other in almost a continuous chain. Every time I stopped I had to make sure no vehicle was coming from behind or from above before I started doing switchbacks on the road to get started. I was stopping every few meters and waiting forever to ensure no vehicle is coming before starting again. I knew it was going to take forever. In the meantime, I used up the two bottles of water I had and began asking for water from every passing vehicle. A generous guy from a car that stopped there to let the heated up engine to cool down filled up one of my bottles. At this point I was stopping, waiting, starting and stopping before any meaningful progress was made. I would go faster if I just get off the bike and started walking. I went past the 20th hairpin and was near the 19th hairpin bend when Vineeth called me asking how was it going. He completed the climb by that time and told me it was only going to get tougher past the point where I was. I was already defeated mentally and exhausted physically with the Sun and the gradient sapping the energy. I felt like a complete idiot. I knew it is going to be very tough. I guess I made it impossible by mentally giving up very early. In the meantime Vineeth descended on the same side instead of completing the planned loop. We’ve decided to head to the resort to get some lunch. It was a 46km ride for him which included the killer climb successfully tamed and a 35kms of pain and disappointment for me. Trying and failing is fine by me. I accept that the gear ratio(42*15) on the Bulldog was too high for such steep climbs. I just wish that I approached it in a more positive frame of mind and was not scared like the way I was the minute I saw the tough grades. I felt I did not fight it hard enough before giving up. I didn’t do the Bulldog justice that day! PS: After the initial disappointment of the failed ride, I’ve decided to stop feeling bad and not spoil the day for Vineeth who had a great ride. After lunch we sat down watching some cycling videos in my laptop. We lazed around the resort for a while. We then decided to drive up to Ooty through the Kalhatty so that I could see the portions of the climb I didn’t make it, to get an idea of what I missed. It felt like a killer climb even on a four wheeler. I was happy for Vineeth for successfully completing such a climb. The Ooty city was bustling with the tourists. We decided to head back and rest up for day two. The day two report is here. I think you've done great on that climb reaching the 20th, considering you were on a steel, single speed commuter! Had you been saddled on a carbon or alum with a range of gear ratios at your disposal, you'd have effortlessly completed 36! I climbed the same stretch on a Trek road frame, so I know. Just got to know that the entire stretch of 36 bends is similar to the last 3 kms of the nandi. So fixie and that gradient not a match but your mindset to take em on is something of mind over matter. 🙂 Great attempt venky..I'm planning to do the ooty climb second week August. I now can fathom the effort on your fixie considering the gradient. Holy cow.. you went till the 20th hairpin bend ?!!! You'd beat the motorcycles to the bushes with a roadbike with Gears..!!! Anyway .. here's my trip report..